Continuous mixing machine for mold production and core production with cold setting binder systems or no bake systems (see Cold-setting process). The mixer also fills the mold or core box with the prepared mold material at the same time. The mold material and binder are mixed continuously in the machine and conveyed to the chute opening via an adjustable height jib which can be pivoted. 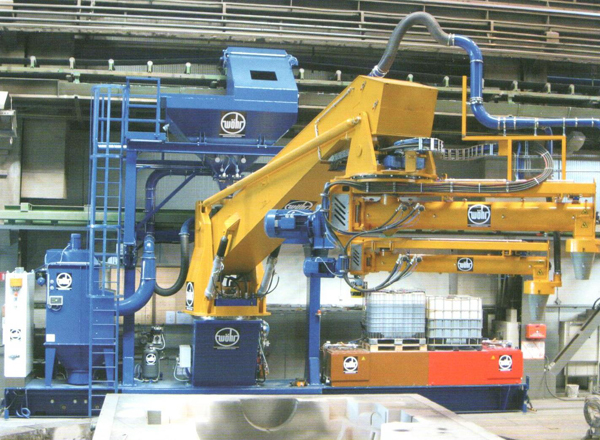 The mold material is compacted in the box by gravity; in addition, the mold and core boxes can be place on jolt tables (Fig.1, AAGM Aalener Gießereimaschinen GmbH). They are characterized particularly by their robust design, user friendliness, performance, durability, economic efficiency, and state-of-the-art technology. This manifests in particular in the mixing quality of the sand, the minimal consumption of binders and curing agents, the short throughput and mixing times, and simple operation and control. These kinds of mixers are available with capacities ranging from 1 - 100 t/h and can be customized to individual requirements in various design variants. The sand dosing system ensures absolutely uniform input of the sand in the mixer and provides the option to precisely set the throughput (tons per hour). The setting can be made either automatically, based on the formula specifications, or manually (Fig. 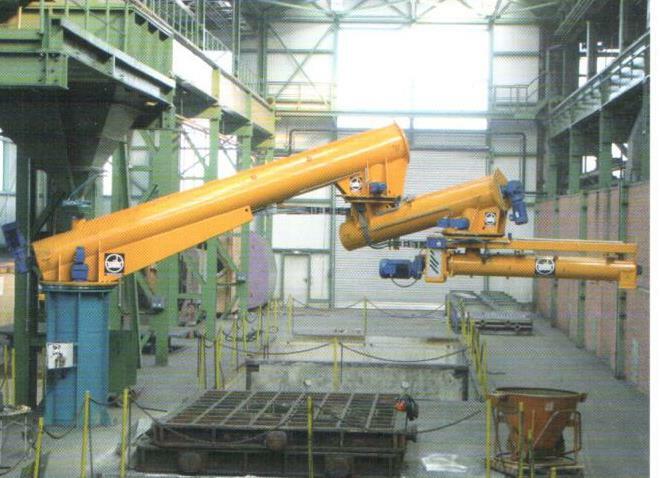 2, AAGM Aalener Gießereimaschinen GmbH). The working area of the continuous whirl mixer can be adjusted in surface area and height through various lengths and setting angles. For simpler operability, it is equipped with an electrical rotary drive. The whirl mixer consists of a vertically divided trough in tube design with easily replaceable internal wearing shells, a mixer shaft with mixing paddles, and the binder dosing system. In order to clean them, the trough shells can be opened sideways and the mixer shaft revealed completely. The internal wearing shells cover the entire length of the mixing trough so that the machine is protected against wear of the basic housing in the entire mixing area. The individual adjustable and replaceable mixing paddles protected against twisting in a form-fit manner are armed with tungsten carbides. Their distance to the internal wearing shells and their angle to the shaft axis can be adjusted. 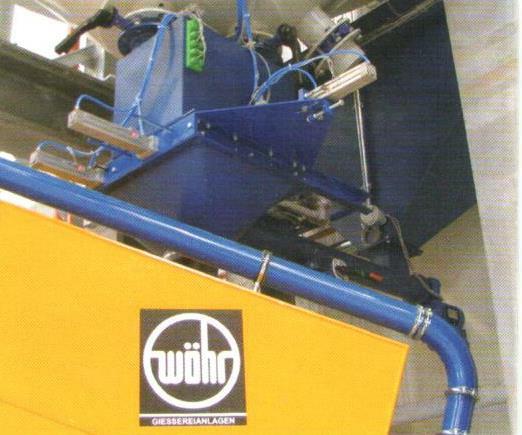 It is also possible to equip the whirl mixer with an electrical rotary drive (Fig. 3, AAGM Aalener Gießereimaschinen GmbH). The binder dosing system consists of special dosing pumps, the feed and drain valves, and the binder injection valves. The rotating displacement pumps consist of a special elastomer stator adapted for the binder and a rotor made of high-alloy stain-less steel, driven by overhead frequency-controlled AC motors. Sealing is affected with a mechanical seal. The feed valves of the pumps are equipped with a dirt filter and dry-running protection. The binder injection valves are cleaned automatically after each mixing process on a time-controlled basis (Fig. 4, AAGM Aalener Gießereimaschinen GmbH). As standard, the control is available in a compact version or in a comfort version, with which all optional accessories can be integrated (Fig. 5, AAGM Aalener Gießereimaschinen GmbH). The comfort version provides the option to store up to 255 formulas as well as the archiving and visualisation of operating data on a graphical operator interface. 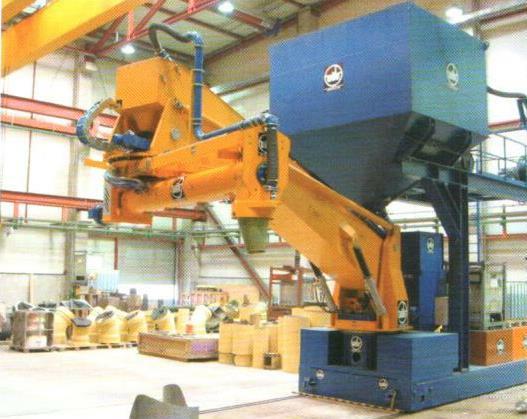 To protect the operating personnel, the mixing trough is locked, monitored, and secured electrically. 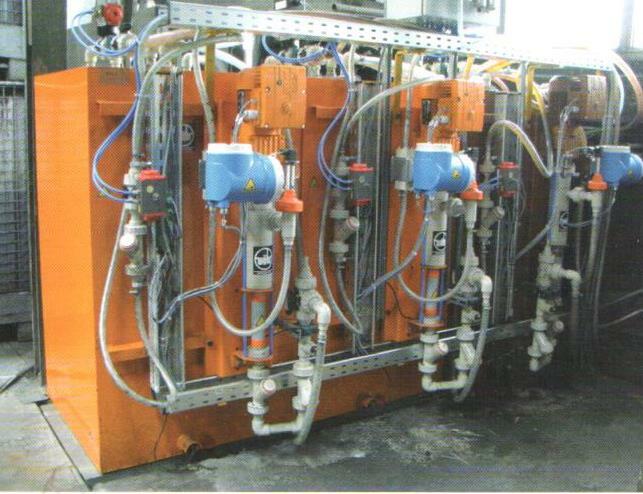 The sand dosing slide and the binder injection valves are controlled pneumatically.